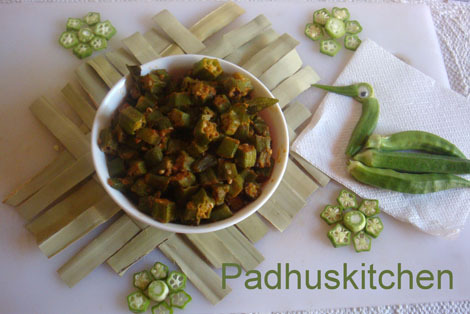 Lady's finger also know as okra is very common in Indian cooking.Okra is known as Vendakkai in Tamil and Bhindi in Hindi. 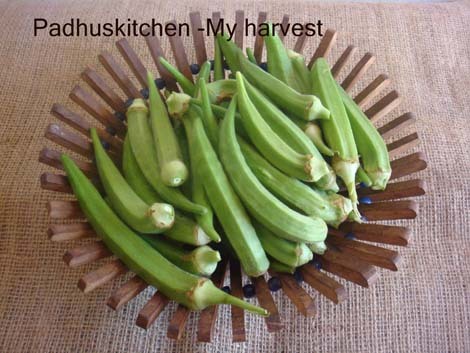 Lady's finger can be grown at home easily. Home grown lady's finger gets cooked quickly and also tastes very delicious. I harvested some vendakkai from my kitchen garden and made this simple vendakkai poriyal-curry without onion and garlic. Heat oil in a pan or kadai, add mustard seeds, when it splutters, add urad dal and curry leaves. Saute till dal turns golden brown, then add the lady's finger, cover and cook. After it is slightly cooked, add turmeric powder, chilli powder, coriander powder, salt needed, 1 tsp curd and cook uncovered till it changes color and is slightly crispy. Keep stirring it now and then for even cooking. This curry can be served as a side dish for rasam and sambar rice. Tips - Curd is added to prevent the lady's finger from becoming sticky. You can also add a tsp of besan (kadalai mavu) instead of curd. Add a few drop of lemon juice while cooking lady's finger for crispy bhindi fry. Variations - Fry 2 tsp of channa dal (kadalai paruppu), 2 tsp of coriander seeds (malli) and 4 dry red chillies in 1/2 tsp of oil until dal turns golden brown. Powder it coarsely and use that podi/powder as required to give a nice flavor to the curry. Check out my vegetable curry podi for more details. Your Vendakkai Poriyal sounds very simple and easy to do. The best part is the tip on how to prevent it from becoming sticky. your blog has always been a boon for bachelors like me who travel to far away lands for job and miss their wife's cuisine. Thanks for that. i did the way mentioned and it came up well.. Thanks for your efforts. I miss my mother a lot. She passed away three month ago. I need to cook myself. I tried recipes from so many sites. I got your recipes close to my mother's preparation. I am grateful to you for all your recipes. Adding curd made it all the more sticky. You would want to revisit that idea. After adding curd, initially, you will feel like that. As you fry the stickiness will go.I have tried it many times. Another suggestion -You can also try adding a few drop of lemon juice for crispy lady's finger fry. If you use the vegetable curry podi, at what point do you add it to the okra? Do you add it on top of the turmeric powder, chilli powder, coriander powder, and salt (or in lieu of those ingredients)? Thank you. You can add that instead of chilli powder or along with chilli powder.In that case reduce the amount of chilli powder.I usually add instead of chilli powder as I do not prefer it too hot/spicy.